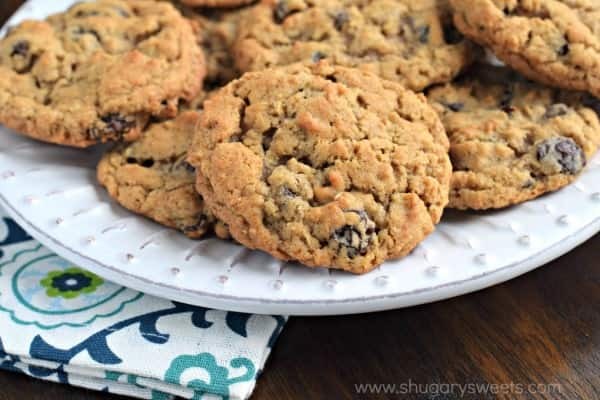 Soft and chewy, old fashioned Oatmeal Raisin Cookies with a hint of cinnamon and nutmeg! 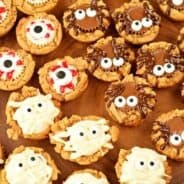 Delicious, homemade cookies like you enjoyed in childhood! There’s not much to say when it comes to Oatmeal Raisin Cookies. You either love them or you hate them. If you’re my kids, you hate them. 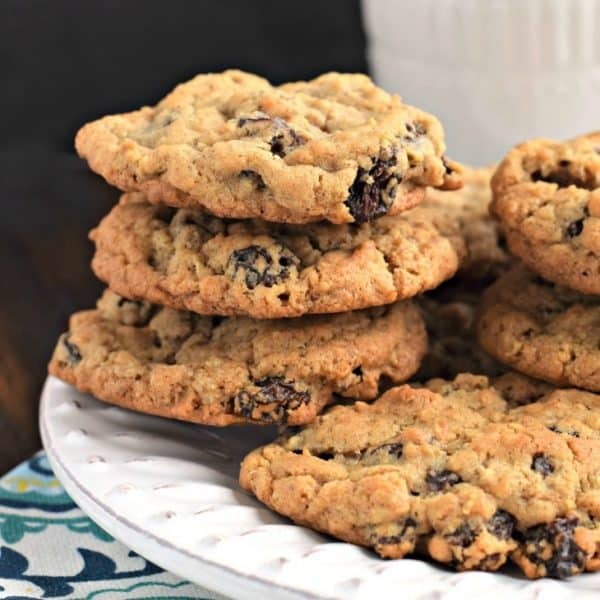 You expect to bite into one and have it be chocolate chips, only to be surprised by a chewy raisin. Me? I love them. I love the chewiness. I love the hint of nutmeg. The delicious raisins (or even a chocolate covered raisin is fantastic…although man, that REALLY throws the kids off)! Preheat oven to 375 degrees F. Line a large baking sheet with parchment paper. Set aside. In a large bowl, combine butter flavored crisco, sugar, brown sugar, egg, milk, and vanilla extract. Add in the dry ingredients: flour, oats, baking soda, salt, cinnamon, and nutmeg. Beat until blended. Drop by large tablespoon onto parchment paper lined cookie sheet. Bake for 11-13 minutes. Remove and cool completely on wire rack. Store in airtight container at room temperature for up to 5 days. You can freeze Oatmeal Raisin Cookies too! Slide baked cookies into ziploc freezer bag and squeeze out excess air. Store in freezer for up to 3 months. Thaw at room temperature overnight and enjoy. Whether I’m making perfect chocolate chip cookies or snickerdoodles, freezing cookie dough is something I do every time. Why not double the cookie recipe and freeze half the dough? Or if today’s recipe is too much for your family, freeze some! Of course you can freeze the baked cookies, but have you ever frozen cookie dough balls instead? Line a metal cookie sheet with parchment paper or foil. Drop cookie dough balls onto pan and freeze for 30 minutes. Remove cookie dough from freezer and slide partially frozen cookie dough balls into freezer safe ziploc container (in a single layer). Label ziploc with type of cookie and baking time. When ready to bake, just place frozen cookie dough balls 1 1/2 inches apart on cookie sheet. Bake according to recipe directions. You may need to add a couple minutes for frozen dough. Now you can have fresh baked cookies ANYTIME. I use butter flavored Crisco in my recipe. I think it gives these cookies the perfect texture. If you’re going to use butter instead (because I know there are some of you who will ask), just know that your texture will be different. They will be a little flatter (as they will spread more in the oven). I would chill the dough before using it, personally, to help combat the spreading if using butter (for 8-24 hours!). Use fresh raisins. If you start with stale raisins, you’ll end with stale raisins. 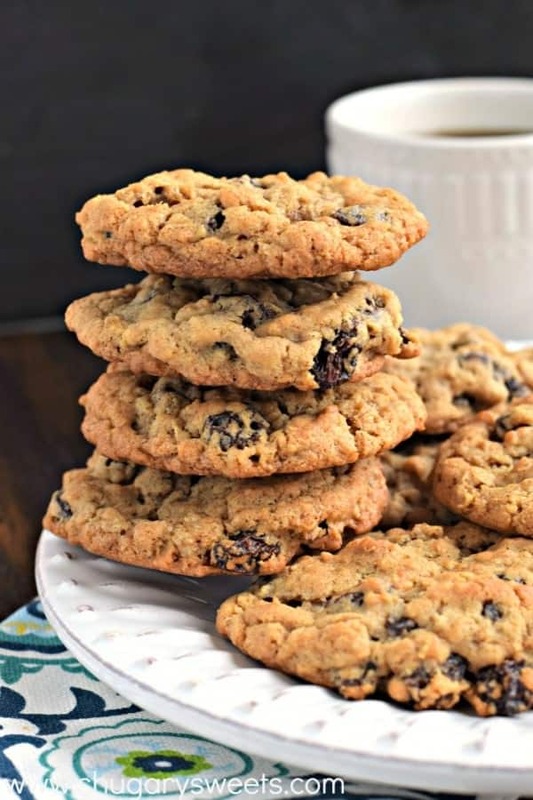 Of course you could easily swap out the raisins for chocolate chips and make Oatmeal Chocolate Chip Cookies. Still soft and chewy oatmeal cookies, but without the raisins! You can also use dried cranberries instead of raisins if you’d prefer, and add in some white chocolate chips. YUM. The best, chewy Sugar Cookies with a no-chill dough. Topped with a creamy sugar cookie icing, you’ll love this Copycat Swig Sugar Cookie recipe! 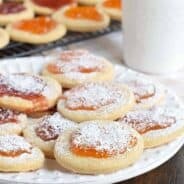 These Easy Traditional Kolachky Cookies Recipe for Christmas have a melt in your mouth cookie base and are topped with sweet preserves. Don’t forget the extra powdered sugar! This Monster Cookie recipe is full of M&Ms, chocolate chips, peanut butter and oats for a cookie that is fun, chewy and delicious! Easy to make and perfect for sharing or freezing! Easy recipe for No Bake Chocolate Oatmeal Cookies! The peanut butter with chocolate and oats gives these cookies so much flavor! Delicious, copycat Iced Oatmeal Cookies. Crunchy on the outside, chewy on the inside, these glazed Oatmeal cookies are a hit! Be sure to follow me on Instagram and tag #shugarysweets so I can see all the wonderful SHUGARY SWEETS recipes YOU make! Preheat oven to 375°F. Line a baking sheet with parchment paper. In a large mixing bowl, beat Crisco, sugars, egg, milk and vanilla until creamy. Add in flour, oats, baking soda, salt, cinnamon, and nutmeg. Beat until blended. *If you want to freeze the cookie dough, drop by tablespoons onto cookie sheet. Freeze for 30 minutes. Place partially frozen dough balls in a freezer safe ziploc bag and store until ready to bake. Add a few minutes to baking time if baking from frozen. ENJOY. That’s why I default to oatmeal chocolate chip a bunch. It’s a compromise for anyone not wanting a chewy raisin! I bet the shortening really makes a difference, so I would never tinker with perfection. We want our cookies nice and thick! 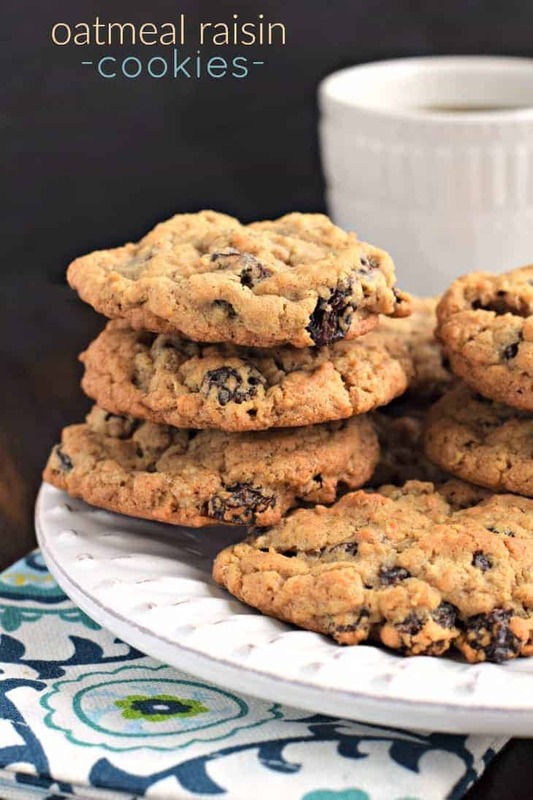 I’d take an oatmeal raisin cookie over a choc chip cookie any day! LOVE them. Love. 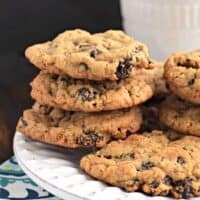 I have an oatmeal choc chip cookie that does very well on my blog because I know tons of people hate raisins, which I don’t get, but hey, give them chocolate chips then and I will keep the raisins 🙂 These look great! Honestly? I would too! I love oatmeal raisin! I make a similar cookie but add in coconut shreds and English walnuts. yummy! I love a good oatmeal raisin cookie! Yours look perfect! Thanks for sharing this recipe Aimee. I do have a question. A lady in our church who has many years ago deceased, used to make the best oatmeal raisin cookie I have ever had. Many of us had her recipe and none of us could duplicate her cookie. I have often wondered if she soaked the raisins before adding them to her dough. I see your recipe does not call for pre-soaking the raisins-is this a step that is considered something bakers should just know to do, and I along with many others in my church also didn’t know? I’ve always soaked my raisins too, I like how soft & chewy they become. I’ve used several different things as my soak liquid over the last 65 years… we really like apple cider, but just experiment to find what flavor if any that you like . Now you have me intrigued on soaking raisins! Thanks Aimee and Abby! Soaking the raisins was the only idea I could come up with that her cookies were so much better than any of us who had used her recipe. 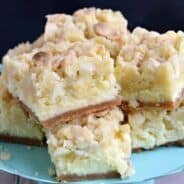 I had never tried that, and seeing this recipe reminded me of those cookies. Like I said, I wondered if this was one of those things that experienced cooks/bakers took to assume everyone knew they should do! Thank you both for helping to clarify! Have always used Sun Maid but don’t think I have seen organic! Will try soaking them, probably in apple cider, to plump them if I feel they are not plump enough! Since I unfortunately despise raisins in anything, I would use Craisins. I’ve used Craisins as a replacement for raisins, and they are delish! Your recipe (using Craisins of course) would surely be excellent. By the way, your blog and recipes keep me coming back for more. Thanks! Yum! I have been craving oatmeal raisin cookies, so I decided to try yours. (Thought it was a sign that we share the same first name ! 🙂 ) They hit the spot. I am curious, the package of raisins I bought had about a cup of raisins left, do you think it would alter the recipe too much if I added the rest of them? I personally like a ton of raisins, but did not know if adding more would throw the recipe off. Thanks again for the recipe, can’t wait to try some of your others!